If you’re a Mozilla Firefox user (like me), you know how convenient it is to be able to search from the toolbar and select the site you’d like to search with a simple drop-down. Now, you can search the Lexicon the same way! Our friend Kai has written a Remembrall plug-in for Firefox. Just click here and follow the prompts on the screen. Firefox may prompt you (just below the tool bar) to allow downloads from the site before it allows you to install the toolbar. 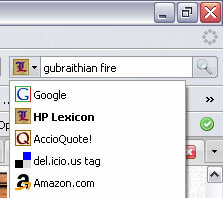 And if you’re an Internet Explorer 7 user (like Bel~) you can add the Remembrall to your search toolbar by choosing “Find More Providersâ€¦” from the drop down menu and following the simple instructions. Edit: Accio Quote! has one now too! Internet Explorer: Go to Accio Quote! and choose “Add Search Providers…” from the drop down menu then select Accio Quote.